My kids are prolific artists - drawing, playdough, anything, they create constantly. I have noticed, though, that they often stick to the same topics. I tried this activity, where they are given a title and must create a work of art with that title. My 3 year old ignored the title completely and made a pizza, but the two older boys loved the nonsense titles and set to work with enthusiasm. It turned into a session of Speed Art, with them creating like crazy and then asking for their next title. Another way to play would be to get every child to use the same title, and see the different interpretations. or, if you are brave, do interpretive dance! Decide on your category (see below). 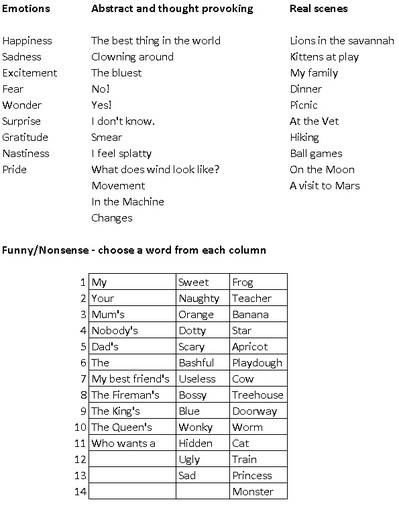 Print or write the topics onto bits of paper and have each child select one at random. Let them create their art, or talk with them about the title until they have an idea of what they can do with it. Chat as they work about the story behind the art - they see lots in there that isn't immediately obvious. Set them up at the end and have an art show! For those who have chosen the last option, take video of the interpretive dance for their eighteenth birthday! 3 year olds don't follow instructions well! What is the Montessori philosophy? Great idea! The nonsense combinations in your chart sound fun! Would be a great activity for a long journey.